You are here: HomenextTransportnextTransport - shipsnextLONDON SAMPSON floating crane. The PLA floating crane LONDON SAMPSON in Tilbury. Along the berth is the Chinese ship LUO FU SHAN. My Father Bill Davis worked on the London Leviathan and Samson ,I saw Samson in Devonport last August 2017 but would love to know what happened to her sister the Leviathan does anyone now ? It’s still in Devonport Dockyard now called Devon Samson. Owened by Bacock Marine. 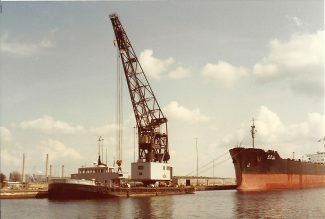 The floating crane barge LONDON SAMSON (built in the Netherlands; 1075 tons gross), joined the Port of London Authority fleet in 1963 and was used mainly in the Royal Docks and Tilbury. Powered by diesel-electric machinery, and 54.9 metres in length, the vessel stayed with the PLA until 1991, when it was sold to a firm in the West Country. Three years later it went to Devonport Management Ltd for service in HM Dockyard, Devonport. In 1997 it ceased to be used as a crane, and I am not sure if the vessel still exists.